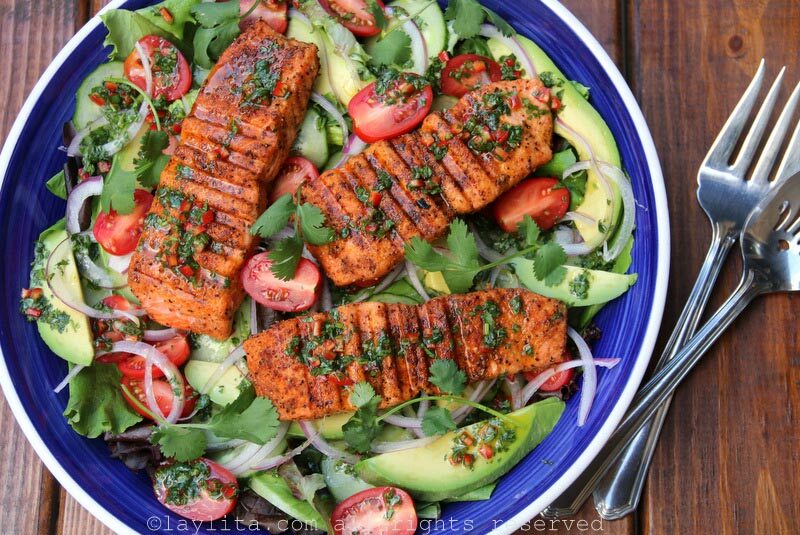 This grilled salmon and avocado salad recipe is easy to make, refreshing and filling. 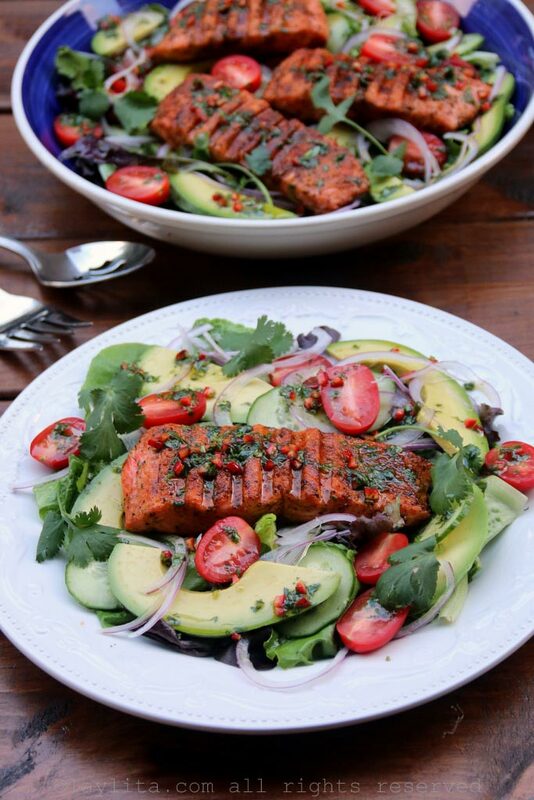 This salad recipe is inspired by a combination of two of my favorite recipes: my grilled salmon with avocado salsa and my basic garden salad with lime cilantro dressing. 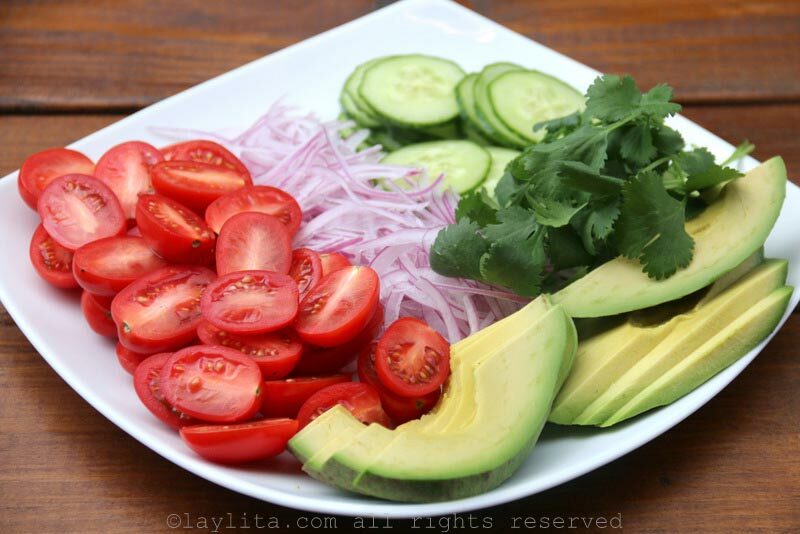 This salad is also very easy to modify and adapt to your tastes or whatever ingredients you have available. 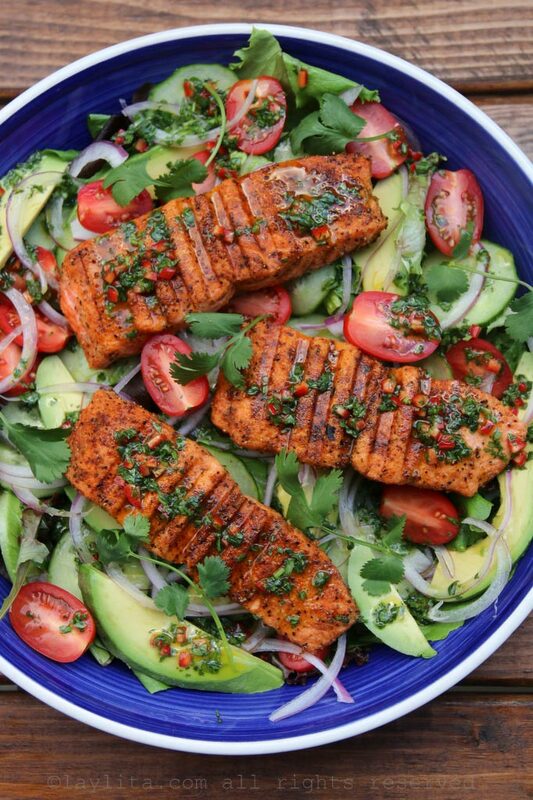 I love using salmon, but it’s also great with corvina/halibut/seabass, mahi mahi (dorado), tuna, cod, or it can also be a way to use any leftover grilled fish. 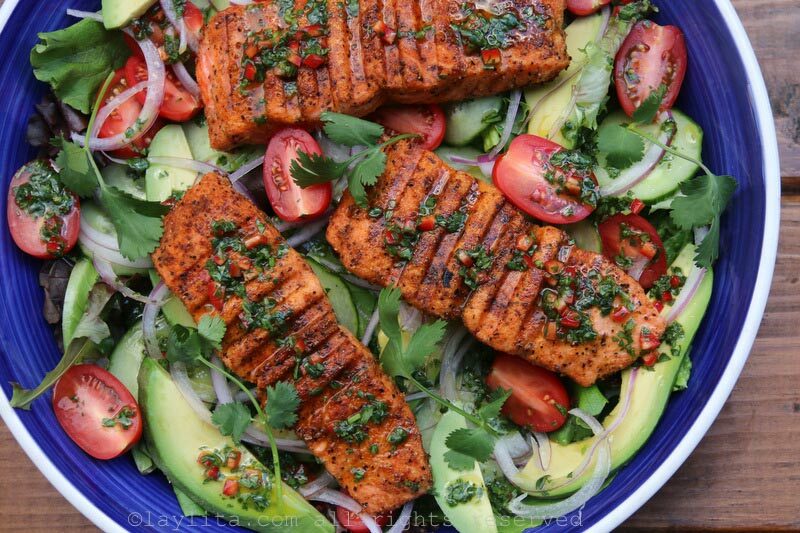 You can also replace the salmon with shrimp or scallops. Or go crazy and make it a mixed grilled seafood salad. 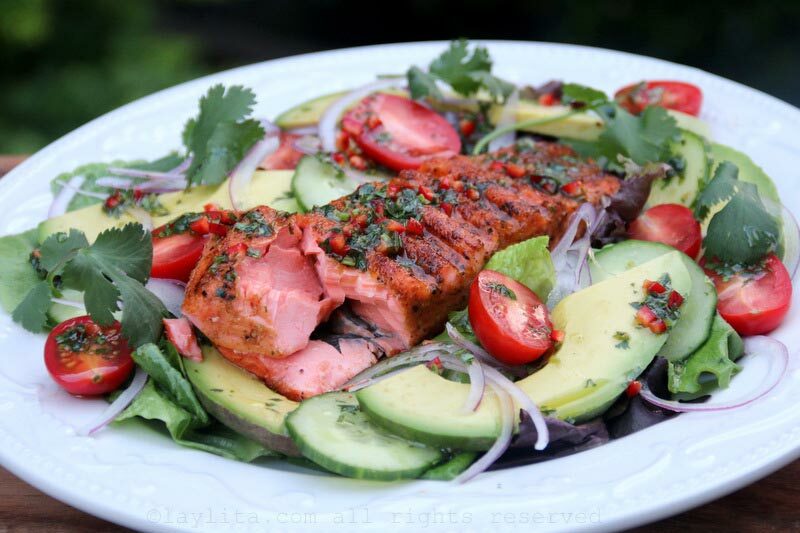 Easy recipe for a grilled salmon and avocado salad with a spicy cumin lime cilantro dressing. Combine all the ingredients for the salad dressing in a jar, close it tight and shake until the ingredients are well mixed. The dressing can be made ahead of time and refrigerated until ready to use. 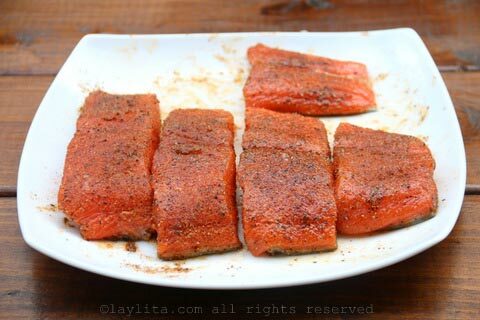 Rub the salmon fillets with olive oil and then with the spice mix. 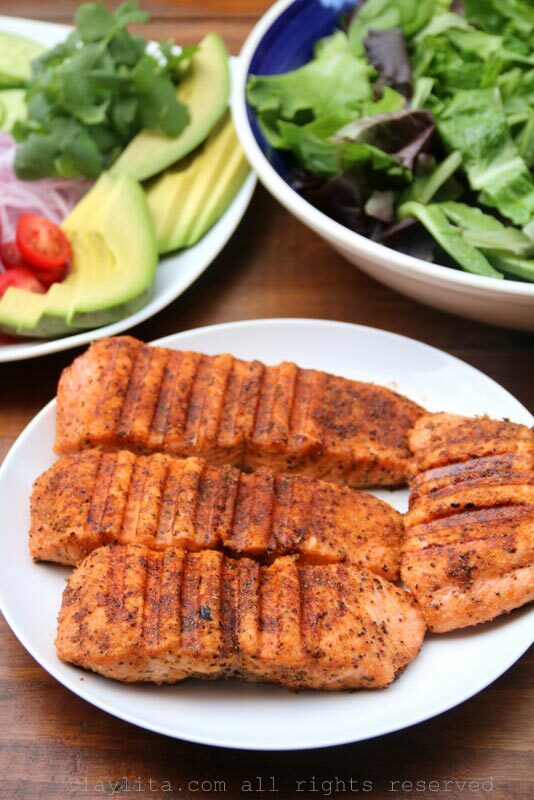 Grill immediately or save refrigerated if grilling later. 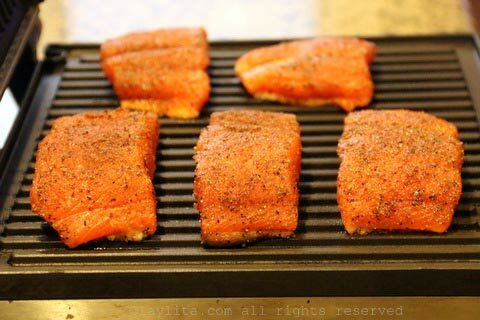 Pre-heat the grill until hot and grill the salmon to desired doneness. 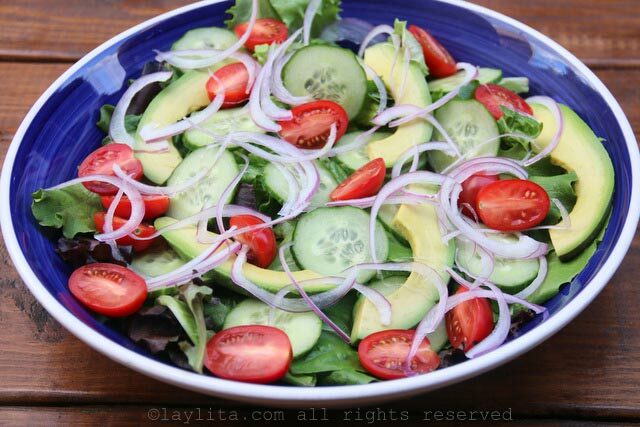 To prepare the salad, place the lettuce or salad greens in a salad bowl, add the avocado, red onion slices, cucumber slices, cherry tomatoes, and cilantro leaves. 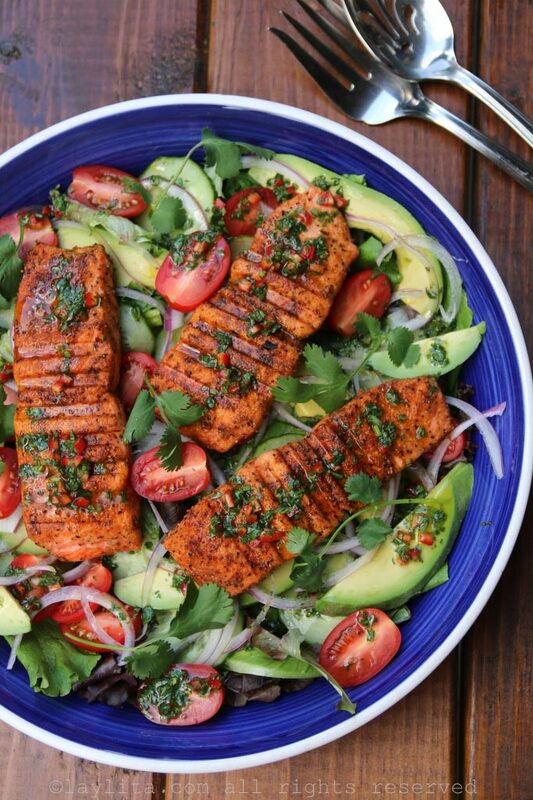 Place the grilled salmon on top, sprinkle the cilantro lime dressing over the salad, and serve immediately. 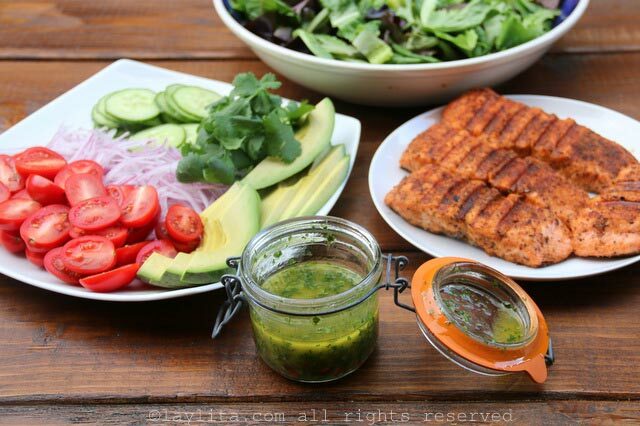 Can also plate each salad on a plate individually. Can also be made with halibut/sea bass, mahi mahi, tuna, shrimp, scallops, or your choice of fish/seafood. 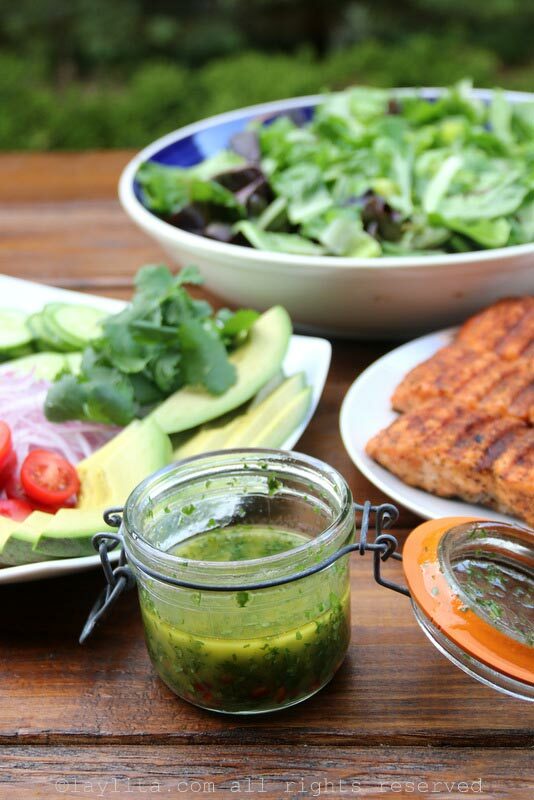 I made a spicy cumin lime cilantro dressing to go with this grilled salmon salad. If you don’t like it spicy, you can replace the hot pepper with a sweet pepper. The salad can be served as a main course salad, or as a starter or side salad. 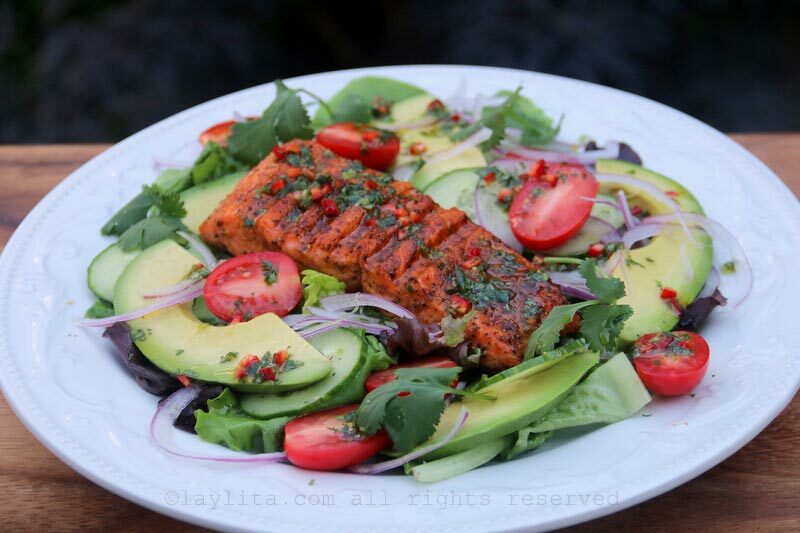 The salad vegetables can also be customized based on your preference, but the avocado is a must-have for this salmon salad. I absolutely love this recipe! I found it on line decided to try it and my family loved it! Now it’s a must have at least once a week. I love that i can try it with other type of fish and it’s still yummy. Thank You So Much! Wish I had this recipe last night. This is a beautiful dish will use the next time we have salmom. Thank you for sharing.